Palawan, the Philippines' most remote province and home to many beaches with super clear water. Another from Scott Sporleder, here is a shot from one of Panama's San Blas Islands, the largest of the politically autonomous reservations of the Kuna Indians. 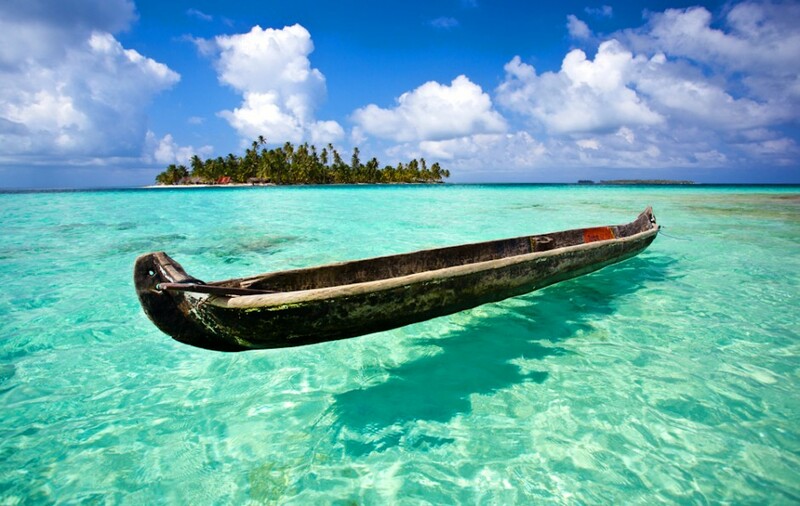 A resort island on Cuba's north coast, Cayo Coco is linked to the mainland by a 27km causeway. The adjacent reef and clear waters have earned international recognition as a dive destination. At the south end of the Mediterranean island of Menorca, the beach at Cala Macarelleta can only be reached on foot or by boat -- probably one of the least-crowded beaches you'll find in Spain. Visibility in Crater Lake has been measured at 43.3m -- among the highest in the world. Photographer Rhett Lawrence adds this note about swimming here: "[It's] allowed, but there's only one access point down to the lake -- a steep, mile-long trail (it's easy enough on the way down, but my then-4-year-old daughter did not appreciate the climb back up). Since that's the only access point, you've got to really want to jump in the lake to do it -- especially since it's so damn cold -- but it is permitted by the Park Service." A shot from the northern tip of Sabah, Malaysia, near Kudat Town. From the photographer: "It takes 3 to 31/2hours drive from Kota Kinabalu city. I wanted to shoot a longer exposure but I had a difficulty judging the light or maybe bcos I was lazy :D kidding. I had to go further the beach, thigh deep and very clear water. Stacked 2 Cokin GND filter P121s, manual exposure 0.25sec, F13." In the north of Sichuan province, the Jiuzhaigou Valley is a national park, nature reserve, and UNESCO World Heritage Site. In addition to several crystal-clear lakes, it's a region of multi-tiered waterfalls and snowy mountains. Tourism arrived late but is growing strong, and while swimming isn't allowed...there's always nighttime skinny dipping. Another one from the remote Malaysian state, which covers the northern portion of Borneo and is ringed by reef-rich islands. This photo was taken near Semporna, which is a hub for people who come to dive Malaysian Borneo. Jenny Lake sits right below the peak of Grand Teton and is a landmark for many hiking trails, backcountry trails, and climbing routes. Despite the fact that motorboats are allowed on the lake, its waters are still considered "pristine." Located in the Pantanal region of Brazil, Rio Sucuri is a spring-fed river that has some of the measurably clearest water on Earth. Multiple tour outfits run trips that let you snorkel the river. Calanques are steep-walled coves, and there's a series of them along the 20km stretch of coast between Marseille and Cassis. Sormiou is one of the largest of these, and it's popular for its nearby climbing routes as well as its beach. Panari, also called Aragusuku, is one of the Yaeyama Islands, the most remote area of Japan. The photographer notes: "The islands are also known as one of the world's best diving destinations, having a number of coral species and marine lives as large as those in the Great Barrier Reef. (Over 400 types of corals, 5 types of sea turtles, manta rays, whale sharks and all kinds of tropical fish species all live around Okinawa.)" The most populous town in the Galapagos still sits right up next to some amazingly clear ocean water. Even here in Academy Bay, you can see pelicans, iguanas, sea lions, herons, rays, and other iconic wildlife. The photo above was taken in the Bonsai Rock area, on the east shore of the lake, which apparently flies under the radar. Says the photographer: "30 years in Tahoe, and until this winter I'd never heard of it." from the central Caribbean coast of Honduras. On the Adriatic Coast north of Split, Primosten is most famous for its vineyards, in addition to beaches that have been voted the best in the country. Photo: Mike Le Gray Photography. The oldest continuously inhabited English settlement in the New World features many historic forts, like the small Gates Fort pictured above. Also: some damn clear water. Visit on a weekend during high season and you'll be surrounded by busloads. If you can get it on a slow day with clear conditions, though, it's some of the best snorkeling in Hawaii. At the very top of the South Island, on Golden Bay, the photographer says: "14000 liters of crystal clear water comes out of these springs per second!" Another calanque on the southern coast of France, d'En-Vau has a narrower, steeper channel than Sormiou, giving a real feeling of seclusion and emphasizing the clarity of the water in this cove. Put in to the Confluence section of the Rio Azul near El Bolsón, Patagonia, Argentina. Matador Senior Editor David Miller notes, "This was the first river I've ever paddled, played, and swam in where the water was clean enough to drink. The entire Rio Azul watershed is born in the glaciers and snowfields of the Andes and the water is incredibly clear and pure." Corfu sits in the Ionian Sea, off the northwest coast of Greece. Prior to the 1900s, most of the tourists that visited were European royalty. Today, its clear waters draw a lot of package-tour-style action. Matador Co-Founder Ross Borden visited the Cook Islands for a week last year and came back with images and video of epicly clear water. Made famous when its smaller neighbor, Koh Phi Phi Leh, was used as the filming location for The Beach, the main island sees a lot of traffic from both backpackers and luxury travelers these days. Water like this is a big part of the draw. This is a 45-minute boat ride from Cartagena and well worth the trip. In between swims in that crystal-clear blue water, be sure to snag some fresh ceviche from one of the vendors walking up and down the beach. One of many bodies of water in this list that someone or other has claimed has the clearest water in the world, Blue Lake is located in Nelson Lakes National Park, in the Southern Alps of New Zealand. This one's made the rounds on the internet, but no one really seems to know where it was taken, or by whom. The best guess I found was the Königssee, a lake in southern Bavaria, near the border with Austria. If you have any info, clue us in. 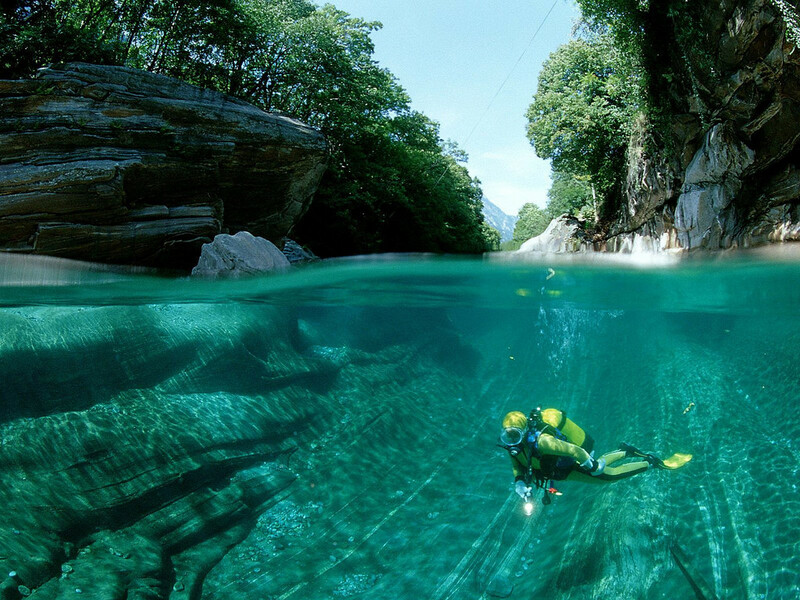 The clear waters of the Verzasca River run for 30km through this rocky valley in southern Switzerland. A dam of the same name, featured in the James Bond movie GoldenEye, blocks the river's flow and forms Lago di Vogorno. Just downstream from it, the river empties into Lake Maggiore. This photo comes from the town of Kampung Genting on Tioman Island, off the east coast of peninsular Malaysia. Away from its beaches, there's significant rainforest terrain in the interior, where you can see the endemic soft-shelled turtle and the Tioman walking catfish.